Peek inside the private life of a bobcat kitten presently in rehabilitation at the facility. You might see him exploring and foraging or even sleeping as he develops and grows. Remember…wildlife is just that, wild and unpredictable, so you may not see him from time to time, but have patience each time you look. 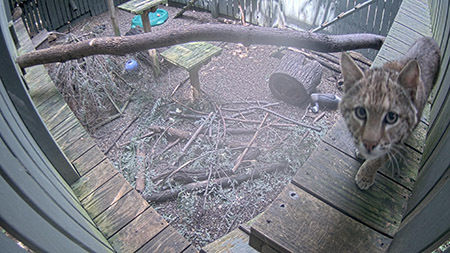 If the webcam is off-line, this will only be for a brief time as we care for the animal or perform camera maintenance. Please check back later. If you have difficulty viewing the camera using Internet Explorer, we suggest trying a different browser. You may catch a glimpse of Apollo, our permanent bald eagle resident, bathing or using his foraging skills to get a food reward from the latest enrichment item placed in his enclosure or from a trainer. Remember…wildlife is just that, wild and unpredictable, so you may not see him from time to time, but have patience each time you look. 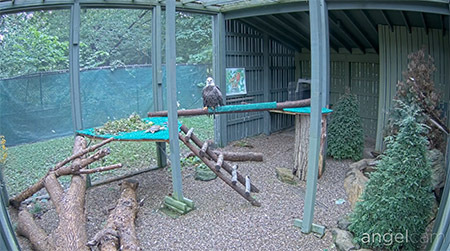 If the webcam is off-line, this will only be for a brief time as we care for the animal or perform camera maintenance. Please check back later. If you have difficulty viewing the camera using Internet Explorer, we suggest trying a different browser. Camera rotates between two views every two minutes. Sunsets are spectacular from the tower; click here for a sunrise/sunset chart. Chapin Forest Reservation is known for distinctive rock formations and majestic forests. Hike through nearly six miles of trails by mature woodland trails comprised of beech, maple, oak, tulip and hemlock. Lake Metroparks offers summer recreational opportunities on the waterfront including kayaking, canoeing, sailing, boating, camps and more.